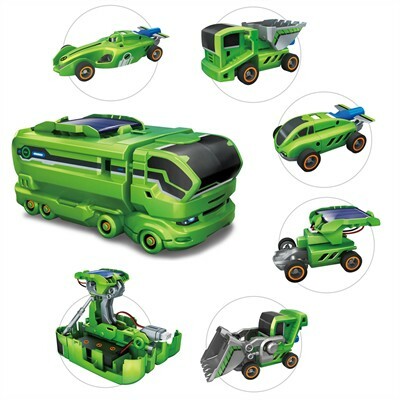 An ingeniously designed 7-in-1 science kit that demonstrates different methods of powering and charging a vehicle and engages creativity and imagination by transforming to different vehicles with the interchangeable parts. The kit allows transforming into 2 types of recharging station (solar powered or battery powered) and 5 different vehicle models. Solar panel and a micro re-chargeable battery are included along with necessary parts and a detailed assembly instruction. Tools you may need: diagonal cutter, scissors and 2 x AAA batteries. Approximate 50 pcs.